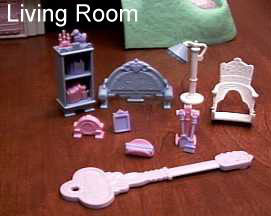 Description: This is a set of living furniture and accessories designed to be used with #5166 Magic Key Mansion or other Precious Places® sets. This set includes a couch, rocking chair, book shelf, and more! The set also includes several tiny accessory pieces that are so small that many were probably lost the first day that the set was opened. These tiny accessories were available in either pink or light purple, and they all fall into the "hard-to-find" catagory. This set was designed for children ages 5 years and older. FPT6963 - White wicker-simulated rocking chair with wicker-simulated sides and backrest. The chair has a hole in the bottom section of the backrest for a Precious Places® figures to stand on the plastic connector piece between the rockers. When a figure is in the chair, a Precious Places® magnetic key can be used to rock the figure in the chair. The center of the backrest has a heart shape on both sides. Measures 1-5/16" wide, 1-7/8" tall, 1-1/2" deep. FPT6964 - Light blue couch with a large arched backrest, but no seat. Precious Places® figures stand in front of the couch, rather than really sitting in a seat. The backrest has a rounded quilted cushion imprint with a large heart-shape in the top center. The armrests on the sides are round with rectangular support legs. Marked "©1989 FISHER-PRICE, MACAO" on the back. Measures 2-1/2" wide, 1-9/16" tall, 5/8" deep. FPT6965 - Tall narrow light blue bookshelf with 2 shelves. The top of the shelf is decorated with scrolled carvings that has a raised heart in the middle with 2 teardrop shapes under the heart. The bookshelf base is slightly recessed with decorative carving on the front, and small rectangular support feet on the bottom. Marked "©1989 FISHER-PRICE, MACAO" on the back. Measures 2-1/2" tall, 1-1/16" wide, 3/4" deep. FPT6966 - Tall white lamp stand with a round base, and a curved neck at the top that holds the FPT6967 lamp shade. The pole has ribbed sides. Measures 2-1/4" tall, 7/8" wide, 13/16" diameter base. FPT6967 - Small round light blue lamp shade with scalloped edges along the bottom, and lines on the sides. The shade has a hole in the top that fits into a peg on the FPT6966 lamp stand's neck. Measures 3/4" diameter, 1/2" tall. FPT6968 - Light purple fire place accessory stand. The top of the stand has little pegs (4 on one side and 2 on the other) that hold fireplace tools. The base is H-shaped with an upright pole in the center that holds the top section. The top of the pole has a decorative ring and a small raised heart shape. Measures 1-1/8" tall, 5/8" wdie, 5/8" deep. *See "Variations" below. FPT6969 - Pink fireplace brush with a thin handle that has 2 rings and a heart shape on top. The heart shape and rings can be attached above any 2 pegs on the FPT6968 fireplace accessory stand. The brush has molded bristles on the bottom. Measures 1-3/16" long, 3/8" wide, 1/8" thick. *See "Variations" below. FPT6970 - Pink fireplace shovel with a thin handle that has 2 rings and a heart shape on top. The heart shape and rings can be attached above any 2 pegs on the FPT6968 fireplace accessory stand. The shovel is flat on the back and flat on the bottom with a U-shaped top. There is a sing around the neck of the pole above the shovel. Measures 1-3/16" long, 1/4" wide, 1/8" thick. *See "Variations" below. FPT6971 - Pink fireplace pick with a thin handle that has 2 rings and a heart shape on top. The heart shape and rings can be attached above any 2 pegs on the FPT6968 fireplace accessory stand. The pick is pointed on the end with a small hook on one side of the end. Measures1-1/8" long, 3/16" wide, 1/8" thick. *See "Variations" below. FPT6972 - Pink bundle of 4 round wood-simulated firelogs molded together. Measures 3/4" long, 3/8" wide, 1/4" high. *See "Variations" below. FPT16880 - Light purple wicker-simulated firewood holder for the FPT6972 fire logs. The holder has 2 half-circle-shaped sides with a gap between them for the logs. Measures 3/4" long. *See "Variations" below. FPT6973 - Pink rectangular picture frame with a triangular-shaped stand on the back to allow the picture to stand. The frame has a recessed rectangular area for a picture and decorative scrolled carvings on top with a round ball in the top center. Measures 11-16" high, 7/16" wide, 3/8" deep. *See "Variations" below. FPT6974 - Light purple clock with with a half-circle shaped top with a tiny heart in the top center. The center has a round clockface with "12", "3", "6", "9", and 2 clock hand imprints. There are 2 raised heart shapes below the clock face and 2 raised teardrop shapes. The sides of the clock have a rounded decorative scroll with squared side supports on the bottom. Measures 15/16" wide, 5/8" high, 5/16" deep. *See "Variations" below. FPT6975 - Pink duck figurine with an oval-shaped base. The duck has a molded bow on one side around it's neck with side feathers by the bow. The other side has molded feathers. The duck has dot eyes and a small beak. Measures 1/2" long, 1/2" high, 1/2" thick. *See "Variations" below. FPT6976 - Light purple candleholder with 3 candles on top. The candle holder has a heart design in the center and 2 tiny teardrop shapes beside the heart. Measures 1/2" wide, 9/16" tall, 3/16" deep. *See "Variations" below. FPT6977 - Pink stack of different sized books molded together side-by-side. The stack includes 7 different books, some with rings on the binder. The top has molded pages, and the back is open and hollow inside. Measures 9/16" wide, 1/2" tall, 1/2" deep. *See "Variations" below. FPT6978 - Light purple stack of different sized books molded together side-by-side with a cat-shaped bookend on one end. The stack of books includes 5 different books, some with rings on the binder. The cat has oval-shaped eyes, a triangle-outline nose, and a line mouth. Cat is sitting up on back legs with front legs upward beside the books. The back of the books is open and hollow, the back of the cat is smooth (no details). Measures 3/4" wide, 9/16" tall, 7/16" deep. *See "Variations" below. FPT16881 - Blue octagon-shaped fabric rug with blue "frilled" designs on the edges. The rug has a light pink octagon-shaped inner ring with dark pink flowers and green leaves on the corners. The center of the rug has a pink flower design with green leaves. There is a pink ribbon row with flowers and leaves between the pink octagon-shaped row and the center flower design. *Note: This rug is pictured in the Fisher-Price dealer catalogue, but we are not sure if it was ever included in the sets sold in stores. FPT6979 - Pink magnetic key with a magnet on one end and a handle on the other end. The handle is marked "Precious Places®" on one side and has no litho. Marked "©'88 F-P MACAO". Measures 5-1/2" long, 1-5/8" wide, 1/4" thick. FPT16882 - Pink fire place accessory stand. The top of the stand has little pegs (4 on one side and 2 on the other) that hold fireplace tools. The base is H-shaped with an upright pole in the center that holds the top section. The top of the pole has a decorative ring and a small raised heart shape. Measures 1-1/8" tall, 5/8" wdie, 5/8" deep. FPT16883 - Light purple fireplace brush with a thin handle that has 2 rings and a heart shape on top. The heart shape and rings can be attached above any 2 pegs on the FPT6968 fireplace accessory stand. The brush has molded bristles on the bottom. Measures 1-3/16" long, 3/8" wide, 1/8" thick. FPT16884 - Light purple fireplace shovel with a thin handle that has 2 rings and a heart shape on top. The heart shape and rings can be attached above any 2 pegs on the FPT6968 fireplace accessory stand. The shovel is flat on the back and flat on the bottom with a U-shaped top. There is a sing around the neck of the pole above the shovel. Measures 1-3/16" long, 1/4" wide, 1/8" thick. FPT16885 - Light purple fireplace pick with a thin handle that has 2 rings and a heart shape on top. The heart shape and rings can be attached above any 2 pegs on the FPT6968 fireplace accessory stand. The pick is pointed on the end with a small hook on one side of the end. Measures1-1/8" long, 3/16" wide, 1/8" thick. FPT16886 - Light purple bundle of 4 round wood-simulated firelogs molded together. Measures 3/4" long, 3/8" wide, 1/4" high. FPT16887 - Pink wicker-simulated firewood holder for the FPT6972 fire logs. The holder has 2 half-circle-shaped sides with a gap between them for the logs. Measures 3/4" long. FPT16888 - Light purple rectangular picture frame with a triangular-shaped stand on the back to allow the picture to stand. The frame has a recessed rectangular area for a picture and decorative scrolled carvings on top with a round ball in the top center. Measures 11-16" high, 7/16" wide, 3/8" deep. FPT16889 - Pink clock with with a half-circle shaped top with a tiny heart in the top center. The center has a round clockface with "12", "3", "6", "9", and 2 clock hand imprints. There are 2 raised heart shapes below the clock face and 2 raised teardrop shapes. The sides of the clock have a rounded decorative scroll with squared side supports on the bottom. Measures 15/16" wide, 5/8" high, 5/16" deep. FPT16890 - Light purple duck figurine with an oval-shaped base. The duck has a molded bow on one side around it's neck with side feathers by the bow. The other side has molded feathers. The duck has dot eyes and a small beak. Measures 1/2" long, 1/2" high, 1/2" thick. FPT16891 - Pink candleholder with 3 candles on top. The candle holder has a heart design in the center and 2 tiny teardrop shapes beside the heart. Measures 1/2" wide, 9/16" tall, 3/16" deep. FPT16892 - Light purple stack of different sized books molded together side-by-side. The stack includes 7 different books, some with rings on the binder. The top has molded pages, and the back is open and hollow inside. Measures 9/16" wide, 1/2" tall, 1/2" deep. FPT16893 - Pink stack of different sized books molded together side-by-side with a cat-shaped bookend on one end. The stack of books includes 5 different books, some with rings on the binder. The cat has oval-shaped eyes, a triangle-outline nose, and a line mouth. Cat is sitting up on back legs with front legs upward beside the books. The back of the books is open and hollow, the back of the cat is smooth (no details). Measures 3/4" wide, 9/16" tall, 7/16" deep. 1989 - FP5176BOX1989 (Box ONLY) - Sold in a 8-3/8" long, 10-3/8" high, 2-1/2" deep box. 1990 - FP5176BOX1990 (Box ONLY) - Sold in a 7" long, 7" high, 2-1/2" deep box. 1990 - FP5176SET1990 - Complete set in a 7" long, 7" high, 2-1/2" deep box.